...just kidding. DBinbox didn't get acquired or anything - I'm just changing the name. If you're already using DBinbox to receive files from your clients, you don't need to do anything. If a client clicks on a link to your DBinbox page, they'll get automatically redirected to your new identical Fileinbox page (for example, dbinbox.com/cgenco will go to fileinbox.com/cgenco). The service you're getting and amount you're paying aren't changing. Why am I swapping the name? 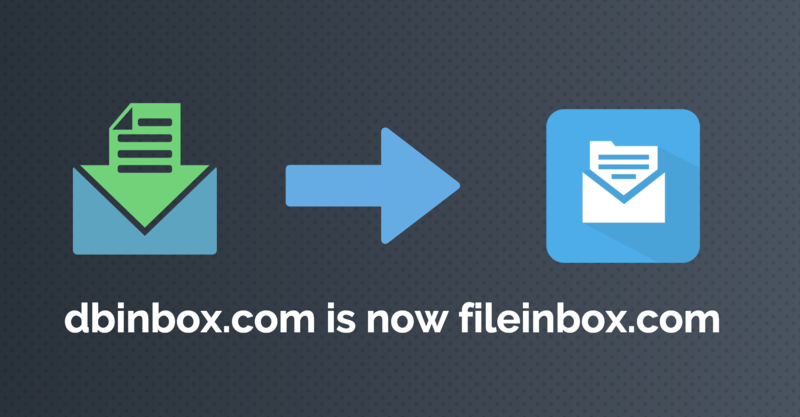 I got the domain name DBinbox.com in 2012 because I was originally focused on connecting just to Dropbox. Looking at where I want DBinbox to grow as a business, that name doesn't make sense anymore. I'm adding support for Google Drive, S3, Box, OneDrive, SalesForce, Hubspot, Zapier, and more. DBinbox isn't just the best way to receive files to Dropbox - it's the best way to receive and organize files no matter where they're stored. So, the name Fileinbox is a great way to express that. P.S. I'm very grateful to my micropreneur friend Danny Weidig for the fileinbox.com domain. If you're in need of a great PC Controlled Intercom and School Bell System, check out his project BellCommander.